We shall assume that long ago [such civilisations] established a channel of communication that would one day become known to us, and that they will look forward patiently to the answering signals from the Sun which would make known to them that a new society has entered the community of intelligence. What sort of a channel would it be?" Jill Tarter is the outgoing Director of the Search for Extraterrestrial Intelligence or SETI and she's with us from California. Hello, Jill. Jill - Hello there, Chris. Chris - What were the channels of communication that Guiseppe Cocconi and Philip Morrison were discussing? What channels are you using and have gone on to use over the last 50 years? Jill - Well, a lot has changed since that original paper. First of all, we now know about planets. Planets are everywhere and it's where we're pointing our telescopes. How are we listening? What channels are we imagining? Well, Cocconi and Morrison figured there would be one radio channel at a frequency of about 1420 megahertz, the frequency of the hydrogen atom, the most abundant element in the Universe. And indeed, the first radio search was done one year later in 1960 using a single channel around that frequency. Today, we use hundreds of millions of radio channels and we search a range of radio frequencies that happen to be a quiet window that nature provides us on the Universe. But it's not just radio. Today, we're also using optical telescopes to look for laser signals and my colleagues here at the SETI Institute in the Sagan Centre for the Study of Life in the Universe, they're not looking for techno-signatures, which is what my group has been looking for, but they're looking for bio-signatures. They're trying to figure out whether there are microbes out there as well as mathematicians that could build transmitters. Chris - So what's the actual infrastructure of SETI like? Is it a massive network of interconnected telescopes that share the data that they're outputting or do you have certain facilities in certain places? How does it work? Jill - Well, SETI is a discipline. 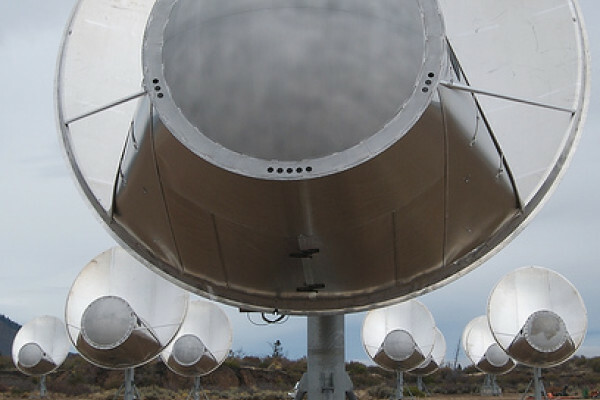 The SETI Institute is one practitioner of that particular discipline and at the SETI Institute, we have built a telescope called the Allen Telescope Array in northern California which has been built with SETI in mind from its inception. We use that telescope 12 or more hours a day with automated signal processing systems that look for narrow band signals; the kind of thing that we don't think nature can produce, but that our technology does all the time. We point our telescopes in the directions of these newly discovered exoplanets from the Kepler spacecraft and from ground-based observatories. Other places such the Berkeley SETI group use receivers on the large radio telescope in Arecibo. They record a little bit of data continuously and they allow people to massage that data with a screensaver on their laptops at home. Other SETI organisations use telescopes in Italy, some in Australia, in Argentina. There's been a little work in Japan, LOFAR in the Netherlands and northern Europe and the UK - it's coming online with a low frequency radio search. And then there are other observatories, primarily university based, that look for bright optical flashes with metre-class visible telescopes. That is the scope of SETI today. It's not at all monolithic. We try to organise collegially, but there are a number of groups doing their own thing. Chris - So it's not just confined or constrained to one particular way of looking for signals. You're actually running across the whole spectrum, aren't you? But space is a massive place, so is it just that we're seeing our message being lost in the medium? There's so much space out there that we just can't scan all of it at the right time to hear what we need to hear? Jill - Well, we haven't done so yet. Although 50 years of searching sounds like a long time to most people, we've hardly begun to explore the 9-dimensional space that electromagnetic signals can exist in. A good analogy, if you wanted to sum up all of that search space and say that's the cosmic ocean that we'd like to explore and then you make the analogy with the Earth's oceans, over 50 years so far, we've scooped about one 8 ounce glass of water from those oceans and examined it. But our tools, our glasses, are getting better much faster, exponentially faster than in the past. And so, over the next decade or two, we should have tools that are commensurate to this huge search, and if we're looking for the right thing, then we have a good chance of finding it - if it's there. Chris - It also presupposes that if we can pick something up, that such a civilisation has been capable of sending these signals for a very long time, because the Universe is a finite age. It's 13.7 billion years old, give or take a few, and if other civilisations are going to get to this stage where they can begin to send signals of the type that we would be able to receive and decode, they must have existed for a very long time already, because of the finite speed of light coming across space to get to us. Does that not put some constraint on what really is possible? Jill - You're correct. We are the youngest kids on the technological block. We are just emerging with the capabilities to try and participate in some sort of interstellar exchange. Most of the stars in our region of the galaxy are probably even a billion years older than the Sun. So, even locally, there will have been opportunities for another technological civilisation to start up before ours did here on Earth. Having said that, we're still constrained by what we know in the 21st century. We can use the tools that we have. We can try to imagine other tools and eventually, if we invent some new technology that seems to make sense for interstellar discussions, then we'll use that too. But right now, the limitation is on us, on the receiving end, given what we know about the universe and the technologies we have at hand. Chris - And how do we actually interpret the data? How do we look for something that's meaningful? Are we looking for something which is meaningful to us, but if we were a very different alien species, it would be meaningful, but would mean nothing to us? Is that a possibility: we're just missing something? Jill - Well, we're using computers to look at the data and therefore, they're finding what we programme them to look for. And in our case, what we're doing is, we're looking for patterns. We're looking for patterns in frequency and time that don't seem to be able to be produced by natural astrophysical emission processes. That is, we've looked at the Universe, we've looked so far at what we know about how molecules and atoms in conglomerates can produce signals, and we've carved out a corner of phase space where nature doesn't seem to be playing. So, if we find these signals, they'll be obviously engineered.